Keeping track of and staying in touch with your suppliers is critically important to the sustainability and long-term success of your business or company. Failing to have a supplier’s contact information on hand could prove to be exceptionally costly should issues arise. That’s why Microsoft designed the supplier checklist template. The supplier checklist template allows you to store all of your important supplier information all in one place. The Microsoft supplier checklist is free to use, download and print. Simply click on the link located on this page to begin! The supplier checklist template is a one-page Microsoft Excel spreadsheet. All portions of the supplier checklist are customizable, so feel free to make any changes that would better fit you or your company. After downloading, save a copy to your computer. In the event you don’t save the supplier checklist, simply return to this page and download it again. There’s no limit to the amount of times the template can be downloaded and there’s never a charge for using it. Filling in the supplier checklist is pretty straightforward and self-explanatory. 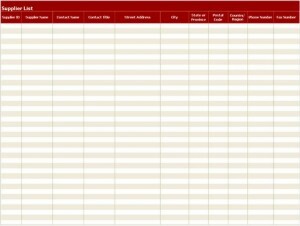 Simply type in or hand write the supplier’s information in the corresponding box. The supplier checklist can be expanded or decreased based on the number of suppliers you are working with. You can also remove columns and categories that are not applicable for your situation. Keep track of all of your suppliers with the supplier checklist template from Microsoft. Download the supplier checklist template for free today!